Garden : Table, garden chairs and barbecue, ping-pong table. Cuisine : a table, 4 gas hob, a grill/microwave oven, a refrigerator, an electric kettle, a toaster, a wok, pots and pans for 6 people. Bathroom : a bath, un handbasin, a bidet, a WC and a large cupboard. The living-room has a table for 6, a comfortable sitting-room suite and a large china cabinet. The first bedroom has a 140cm double bed and a writing desk, the second, much larger , can sleep 3 people (a 140cm double bed and a single bed). Le gîte has central heating and has a high-speed wireless connection for internet. Several books are available for consultation; games, CD's and DVD's may also be borrowed. The appartement is situated on the first floor of the main building and has it's own private entrance from the street. You may enjoy your meals outside in the garden under the shade of a hundred year old accacia tree where a barbecue, a table and chairs are installed. From the garden a staircase leads onto a little sundrenched terrace. Overlooking the studios there is a view of the Lergue valley and the surrounding hills. The spacious and comfortable gite has a triple orientation: it's surface of 75m² can sleep up to five. It has a contempory feel, mixing antique elements with modern artwork. 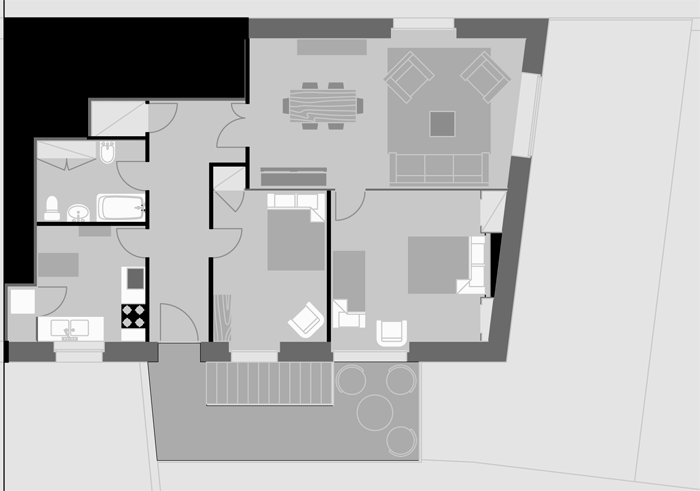 The space is organised as follows: from the terrace a large hallway leads on to the kitchen, a first double bedroom, the bathroom and the living room. This grand living room has both a view of garden and the town and leads onto the second bedroom. Guests may also use the vast covered garage, the enormous courtyardand and the bank of the river. The location in the heart of Lodève means you may leave your car asside and stroll through the town's shaded streets - all cultural, sport, touristic and commercial activities are accessible by foot.